Fruit and vegetables, superfoods, gluten-free products and more! 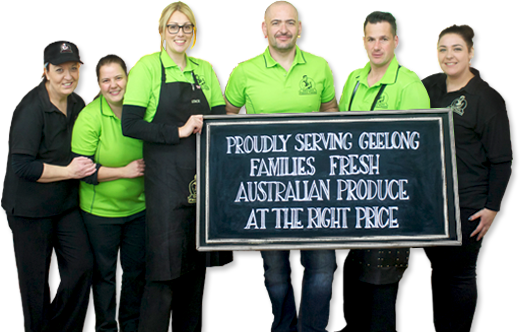 Geelong Fresh Foods is a gourmet food store stocking a variety of fine food to keep you happy, healthy and full of energy. As a leading fruiterer in Geelong, you will find fresh fruit and vegetables stocked daily, a product of nightly fruit and vegetable runs to the Footscray market! A range of gluten-free products caters for those with coeliac disease or gluten sensitivity (non-coeliac). You will find plenty of gluten-free snacks and foods stocked on-shelf near the extensive range of health foods. Health foods include greens such as spirulina, nutrient-dense powders such as maca powder and raw organic cacao powder and coconut products such as oil, sugar and yogurt. Many of these foods are referred to as “superfoods” which simply means they have a high concentration of vitamins and minerals. The shop doesn’t just stock gluten free produce though, there is also a gourmet deli and section full of continental groceries! Food products include freshly baked goods, cheese, olives, dips, yogurt and much more. You will find quality locally made sweets, spreads, pickled food, muesli and more. The friendly staff will happily guide you to the products you need and help with your selection. The business is proudly family owned and operated and prides itself on providing quality food, at the right price, with a smile. Local produce is stocked wherever possible, with an impressive list of producers from Australian and international sources. Please contact Geelong Fresh Foods for enquiries.